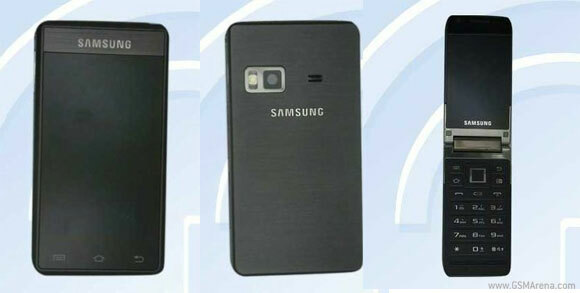 Samsung has announced yet another dual-touchscreen Android flip phone, this time exclusively for China's second largest carrier China Unicom. Carrying the GT-B9120 moniker, the peculiar Android flip phone is practically the same as the previously announced dual-SIM Samsung W999. It features two 3.5-inch Super AMOLED touchscreens with a resolution of 480x800 pixels each. Inside, there's a 1.2GHz dual-core Qualcomm MSM8260 Snapdragon processor, 1GB of RAM and 16GB of built-in storage. The GT-B9120 runs Android 2.3 Gingebread and features HSPA, Wi-Fi, Bluetooth and GPS. The back of the phone carries a decent 5MP snapper, while a 1.3MP front-facing camera takes care of video chats. It's currently unclear when exactly China Unicom will put the device for sale and for what price, but expect it soon. It's a pity Samsung won't launch the unusual droid anywhere else. One can still hope, though. The market needs a decent flip phone. There are numerous buyers that want flips. I've had a Nokia 6290 for 6+ years, magic. A phone is a phone, not a mini computer. Please release this phone around the world Samsung. Some of us still like flip phones.